The company that lets you compare air fares and translate foreign languages online wants to make it easier to weigh the costs and benefits of installing solar panels on household rooftops. Google is rolling out a new online service that quickly tallies up considerations of going solar and whether homeowners should consider buying or leasing photovoltaic panels costing thousands of dollars. Google's Project Sunroof combines the eye-in-the-sky images behind Google Earth with calculations on how much shade trees cast over a rooftop, data on local weather patterns, industry pricing and available subsidies to arrive at its bottom line. The service expanded in December to analyze properties in the Raleigh area, as well as 15 other metro areas in Arizona, Nevada, Connecticut, New York, New Jersey, and Colorado. 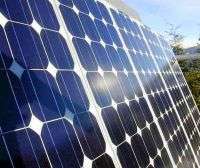 Interested potential customers are referred to solar-panel installers for further follow-up, cutting their marketing costs, said Carl Elkin, the senior software engineer behind the service. "We at Google believe in solar energy. The solar industry needs our help," he said. Google has invested more than $1 billion in recent years into solar energy, including $300 million earlier this year into a fund that finances residential rooftop projects installed by SolarCity Corp. Google invested $280 million in the publicly traded company in 2011. Project Sunroof launched this summer in San Francisco and Fresno, California, and Boston, where Elkin works. The metro areas were picked based on several criteria, including Google's available satellite imagery and local market conditions including government incentives, Elkin said. Google's proposition is a faster, simpler way of sizing up possible pros and cons of solar than calling out someone for a site evaluation or using the more complex calculator offered by the U.S. Energy Department. An Associated Press reporter who plugged in his Raleigh home address was informed that installing solar panels would likely be a money-loser based on the amount of usable annual rooftop sunlight, shading from surrounding pine trees, and current household power use. But if the reporter chose to pursue the idea further, buying rather than leasing or a loan would be the better deal. Google's increased involvement in solar comes as some states begin to re-evaluate policies that have helped stimulate the rapid growth in turning the sun into electricity. All but a handful of states have laws allowing what's called "net metering" for homes or businesses—basically selling power from rooftop cells they don't use themselves, usually to the local electric utility, according to the National Conference of State Legislatures. In December, Mississippi became the 46th state to adopt broad rules promoting solar power. In Texas and some of the remaining states, individual utilities may offer similar solar-purchase options, according to the Solar Energy Industries Association, a national trade group. Solar accounts for about 1 percent of the country's total reported electricity generation, according to the U.S. Energy Information Administration. About two-thirds of that is from utility-scale solar arrays that are often spread across rural tracts. But as many as two dozen states are considering changes that would reduce the incentives for solar customers under the theory they too should pay for the broader power grid. Nevada utilities regulators last week adopted a policy to reduce by 75 percent over five years the amount Las Vegas-area electric company NV Energy pays customers for extra power their solar panels produce. The change means rooftop solar customers will pay more of the costs now shifted to non-solar customers to maintain the utility's transmission lines and power generation.